When a dog attacks, the best way to fight him off is to not actively engage in the altercation. 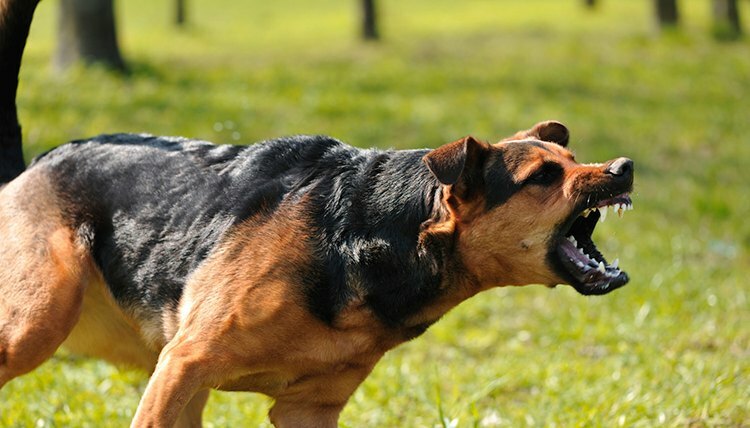 Unlike fighting off a person, who may remit to a physical response, proactively fighting back when a dog attacks will likely make the situation worse. Instead, you need to fight him off by protecting your body and removing any incentive he may have to keep up the attack. Only then will he disengage and leave you alone. Tip #1 - Avoid eye contact. Stay upright but keep your head down and your eyes averted. When you look an angry dog in the eye, he perceives it as a direct challenge, and it may motivate an attack. Resist the urge to frighten the dog away or scold him into submission, as yelling or attempting to intimidate a dog that's challenging you will only make him angrier and more likely to attack. Tip #2 - Stand still. Running from the dog makes you look even more like prey to be chased down and physically subdued, and odds are you won't outrun him. Tip #3 - Reduce the number of things that the dog can grab onto. Keep your elbows in and your fingers curled up with your hands at your sides, as long as you're standing -- this makes your appendages less readily available and vulnerable. While you do this, find a nearby stick that you can grab. Tip #4 - Stay as still as you can if the dog attacks. If he bites, don't try to shake him off, and don't attack him with kicks or punches. Instead, jab the end of the stick you found on the ground into the dog's mouth and down his throat. This will make him gag long enough to release you from his jaws. Tip #5 - Curl into the fetal position, facing the ground, if the dog brings you to the ground. With your knees tucked up underneath you, the vital organs in your stomach and chest are protected, as well as your legs. Cover the back and sides of your neck with your hands to protect it, and keep your face pressed to the ground. Stay curled in this tight little ball and remain as motionless as possible -- the dog will tire of you soon and leave you alone. Tip #6 - After a dog attack, seek medical attention right away and contact the police as quickly as possible.